Classes are currently underway, but new students are ALWAYS welcome. Good News booklets will be sent home for family study while we focus on the Sacramental Preparation part of the year. Currently we are working on our Blessed: Reconciliation book. The Reconciliation Retreat is Saturday 2/16/19 from 9:00-noon. 1st Reconciliation takes place on Friday 2/232/19 at 6:00 PM. There will be 3 priests available. 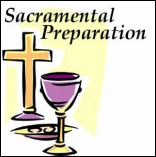 At the end of February/early March we will begin our 1st Communion preparation. We will be using the Blessed:Eucharist books. Information on family videos will be sent home with the children. 1st Communion retreat is April 27 from 9:00-noon. 1st Communion takes place at each Mass over the weekend of May 4 and 5, 2019.